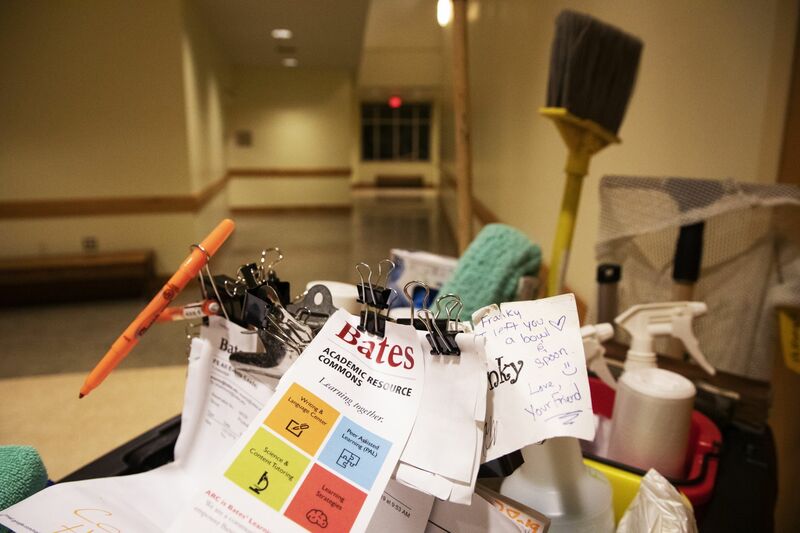 Academics at Bates is an aerobic activity, and we’re still catching our breath after spending 17 hours in Pettengill Hall following the lickety-split pace of professors, students, staff, classes, and, yes, two pugs. Dedicated 20 years ago and designed to spectacular effect by Shepley Bulfinch, Pettengill is home to the college’s social sciences and related interdisciplinary programs. 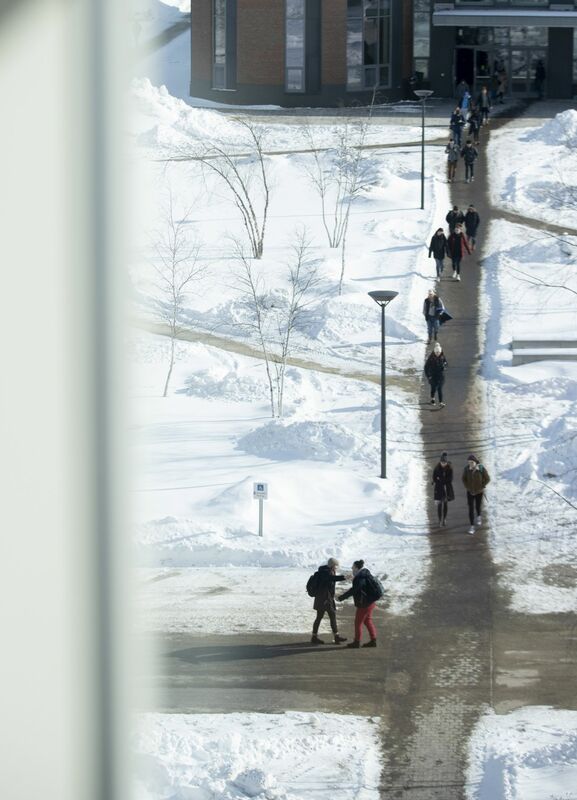 And it’s really big: four levels, plus the rooftop Moody Room, and 91,000 square feet containing 70 faculty offices, 15 class and seminar rooms, eight department or program lounges, and the three-story jewel, Perry Atrium, lovingly known as “the snow globe” by students. 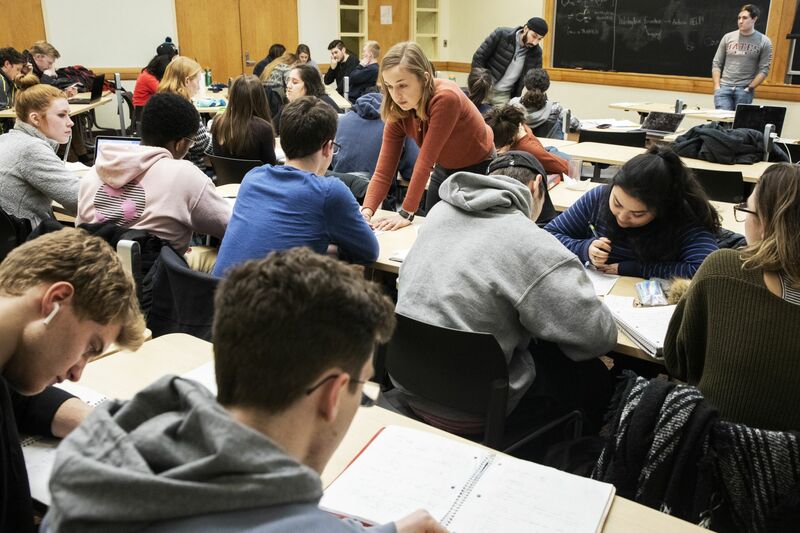 Twenty years ago, then-President Don Harward said the design of academic spaces can either “restrict or liberate how well we teach.” With Pettengill, the result was liberation — the liberal arts writ huge. 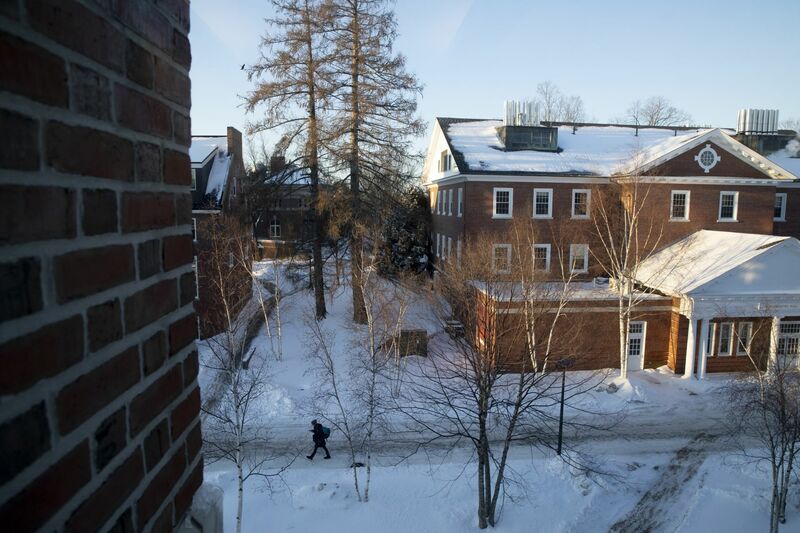 From 4:12 a.m. to 8:39 p.m. on Jan. 31, we roamed all around Pettengill Hall to share with you a day in the life of Bates academics. Onward! 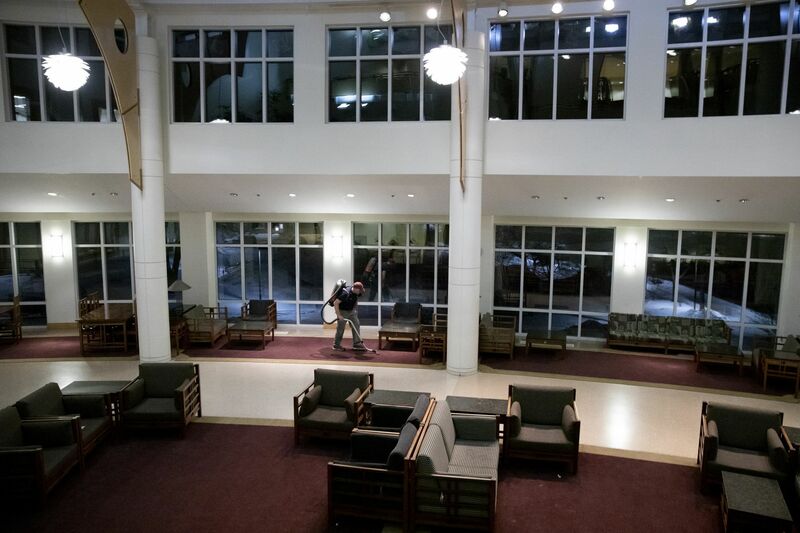 In Pettengill Hall — four hours before the start of classes, three hours before the dining hall opens for breakfast, and two hours after Chase Hall closes to students for the night — custodian Randy Maxwell begins his shift. 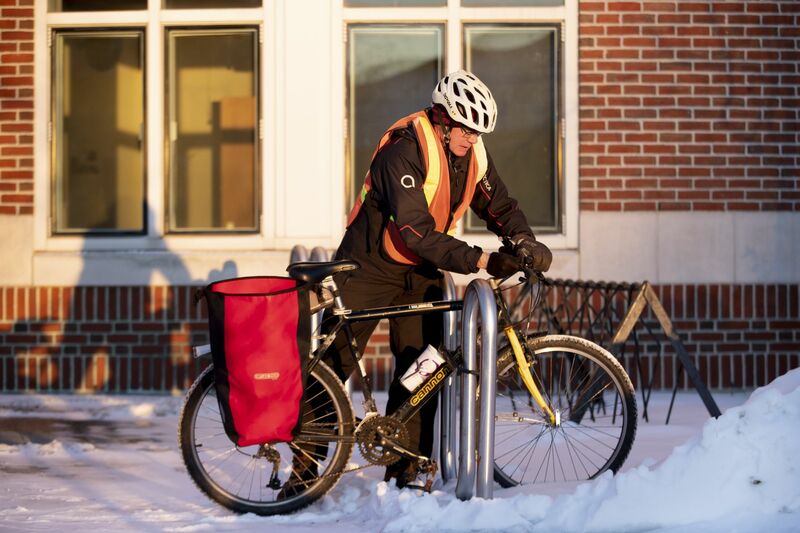 Elsewhere in the country, temperatures are plummeting to record lows and universities are shutting down, but in Lewiston it’s a balmy zero degrees Fahrenheit. An ordinary day. For most of the day Maxwell covers the second and third floors, each with two long hallways, a large computer lab, lounges, and seating areas near the stairs. But he likes to start on the first floor, vacuuming carpets and wiping down chalkboards and tables in the classrooms. His custodial and faculty colleagues will arrive later in the morning. “I like to give them a good start,” he says. In the Perry Atrium, with its vast expanses of carpet as well as nooks and crannies between tables, Maxwell finds a pair of mittens and deposits them in a lost-and-found. As he vacuums a long black carpet in the building’s entryway — these carpets can hold several dustpans’ worth of sand in the winter, he says — the sun begins to rise. 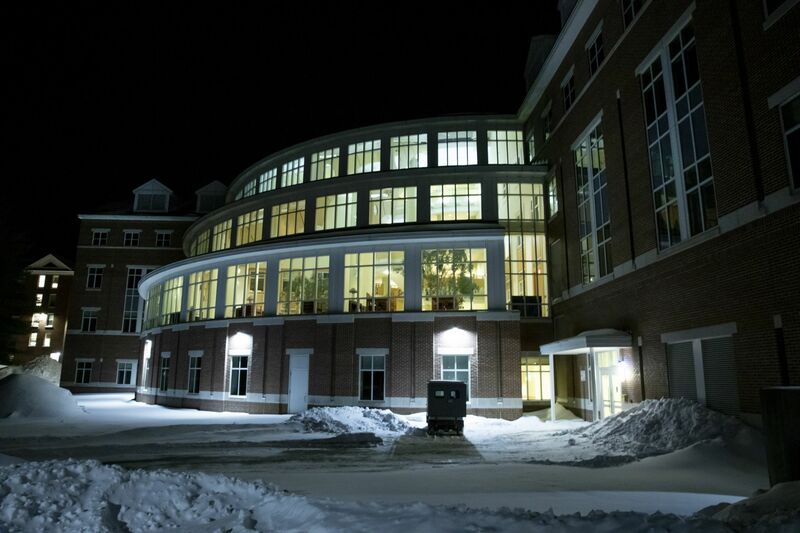 It’s still more than 90 minutes until sunrise, but it’s the dawn of another day in Perry Atrium. 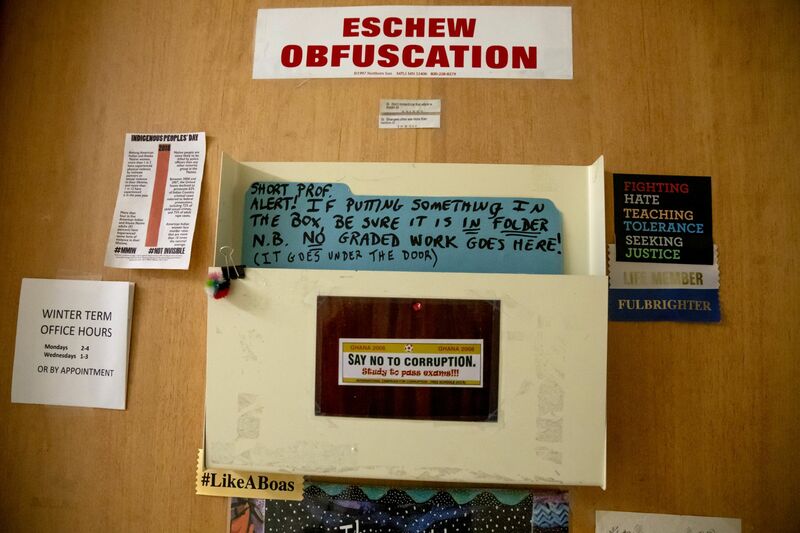 This office door belongs to Associate Professor of Anthropology Elizabeth Eames. The bin has a “short prof alert”: She won’t find anything that’s dropped off but not placed in the folder. 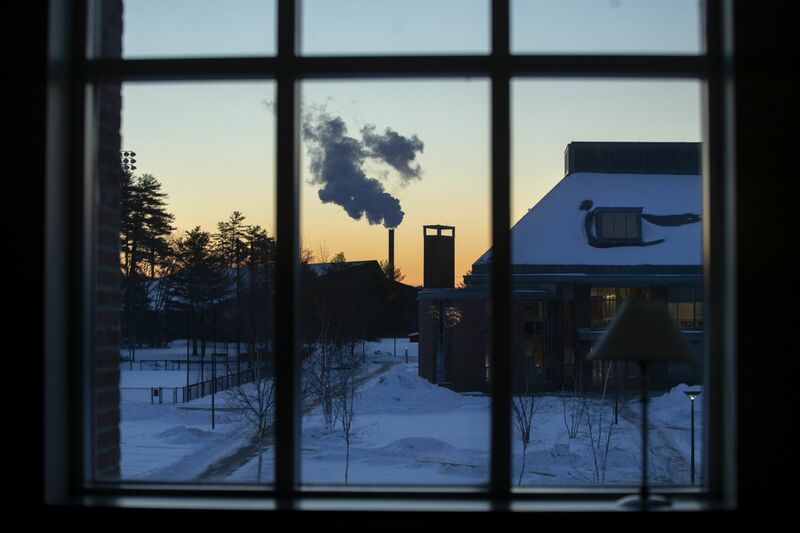 It’s 5 degrees below zero, and the boilers at the Cutten Maintenance Center chug right along. That steam is not from burning fossil fuels but from Renewable Fuel Oil, made by vaporizing wood feedstock (e.g., sawdust) at a very high temperature. 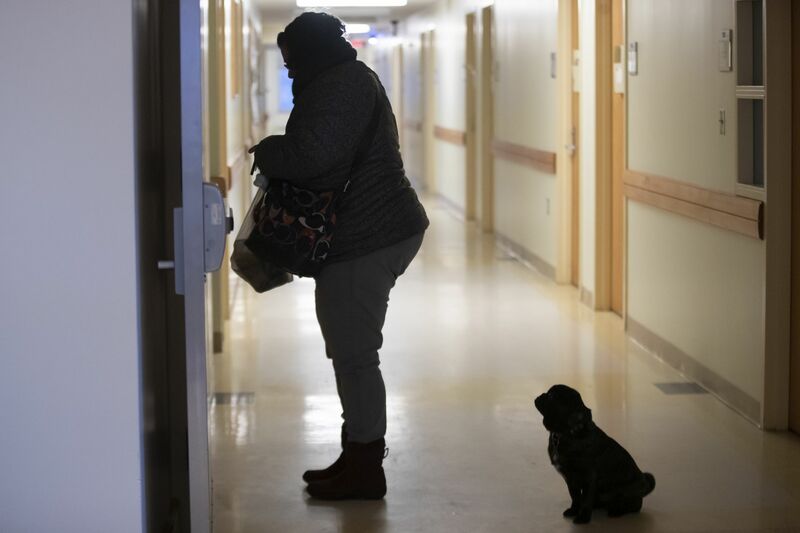 Catie Moran and her pug, Teddy, arrive at their office on the first floor of Pettengill. Moran is an academic administrative assistant who supports faculty in anthropology, digital and computational studies, history, and politics. Every…single…day. Associate Professor of History Joe Hall, who lives in Auburn, arrives at Pettengill on his bike. It’s chilly on the ground floor and downright frigid outside, around 10 degrees and windy. But a big window at the end of a Pettengill corridor distills the visual beauty of this January morning: sun just beginning to strike the tops of buildings and the tops of trees — including these two larch tamaracks between Dana and Hedge — blue shadows, and windblown snowflakes making a slight sparkle in the breeze. Jack Culver ’22 of Bellevue, Wash., arrives before 8 and settles into a second-floor stairwell nook to study for a cultural anthropology course. He’ll stay for several hours, until he goes to another anthropology class later in the day. 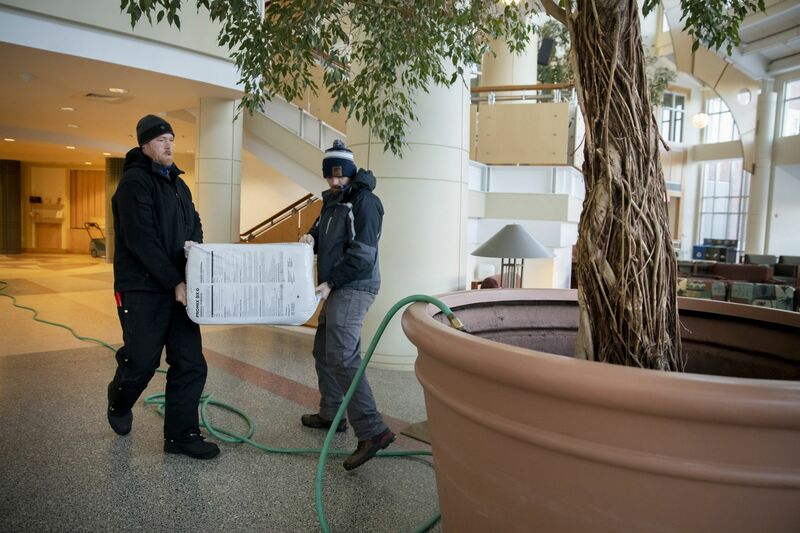 “We got a quiet morning, so we decided to go in,” says groundskeeper Jon-Michael Foley, running a hose to one of two ficus trees that reach two floors high in the atrium. There’s enough air circulating in the 8,000-square-foot room for the leaves to blow in the breeze. Michael and horticulturist Michael Fox are preparing to resoil the trees, possibly for the first time in the 20 years the trees have lived in the atrium. The two add the soil, then water the trees. An earthy smell fills the atrium, creating a sense of tranquillity before students arrive for class. If you don’t count the silo-esque mechanical space on the roof, the crown of Pettengill Hall is the Moody Room, a big elegant conference chamber occupying most of the fourth floor. Given by James L. Moody Jr. ’53, a former chair of the Bates Board of Trustees, the room is named in honor of his late wife, Jean Pratt Moody, and is used for trustee meetings. 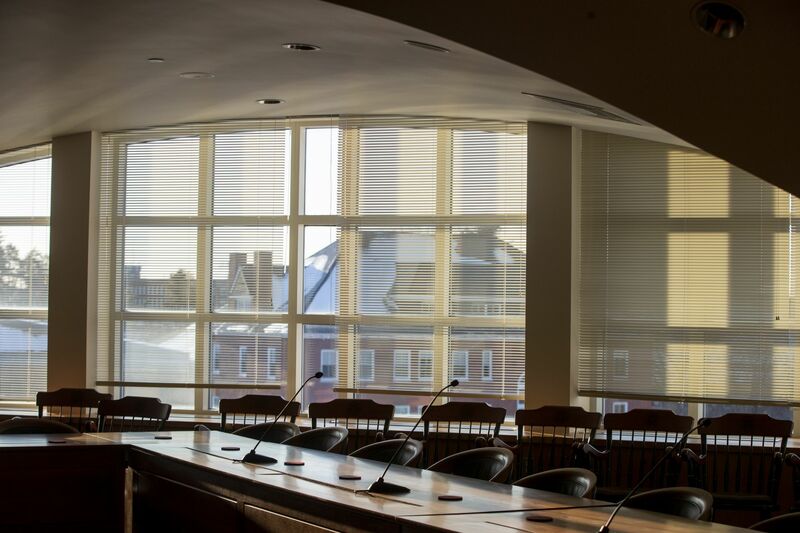 Moody is dominated by its sole source of natural light — but what a source: a large eyebrow window, comprising three sections and dozens of panes, that provides an expansive view of central campus and as far southeast as the cupola on Lewiston Middle School. Once you can pry yourself away from that panorama, the Moody Room presents a much different feel. The room is all but silent and its edges where the ceiling dips low are in shadow. Forty stately wooden swivel chairs are lined up snug against the expanse of the cherry-wood Thomas Moser conference table. Microphones that enable people to hear each other around the big plush room stand at attention on that table. The Moody Room is poised and waiting for the next meeting — which in fact takes place the day after next. 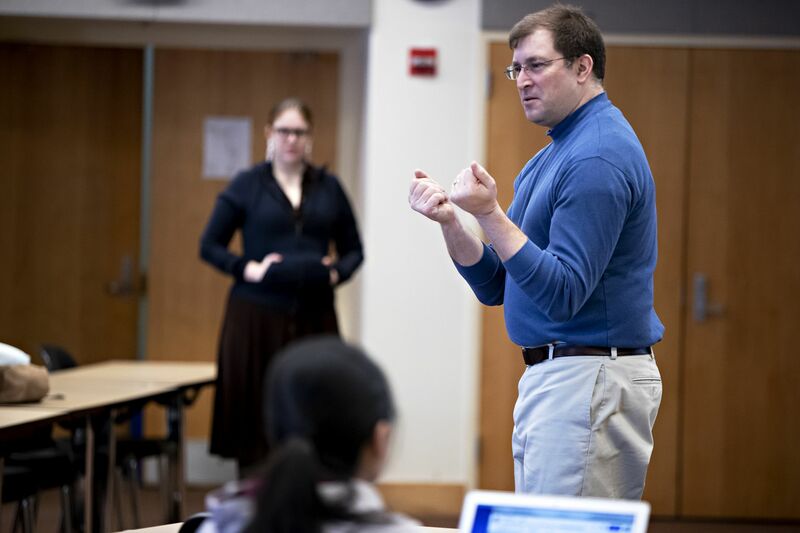 Professors Anelise Shrout and Matt Jadud, members of the Program in Digital and Computational Studies, begin their class on data visualization by checking their 40 students’ understandings of various programming concepts. So, does everyone understand functions and variables? The class takes place not in a computer lab but in Room G52, the Keck Classroom, where Shrout and Jadud use one of the room’s two projector screens and an old-school chalkboard to review what they taught in previous sessions. Students work on their laptops, using the programming language Python. After the review, the students break into pairs to work on their latest assignment: creating animated visualizations of temperature, wind speed, and wind direction data collected around Lake Auburn last fall by Holly Ewing, Christian A. Johnson Professor of Interdisciplinary Studies. Jadud, who is the college’s inaugural Colony Family Professor of Digital and Computational Studies, works with Christine Cho ’19 (center) of Novato, Calif., and Jamie Siegart ’21 (right) of Manchester, N.H.
Siegart has chosen to represent the temperature on the lake over the course of September and October using moving bar graphs, while her partner represented windspeed with a stoplight. A few rows behind them, partners Nicholas Lambert ’19 of Snellville, Ga., and Sam Huebschmann ’19 of Lynnfield, Mass., are comparing their visualizations. Huebschmann has also made a bar graph, while Lambert has made a sort of pinwheel, which spins faster or slower depending on wind speed. The large data set might mystify the non-expert viewer; Lambert is excited to have written code that makes the numbers more accessible. “When I first started learning Python, I didn’t imagine this application,” he says. 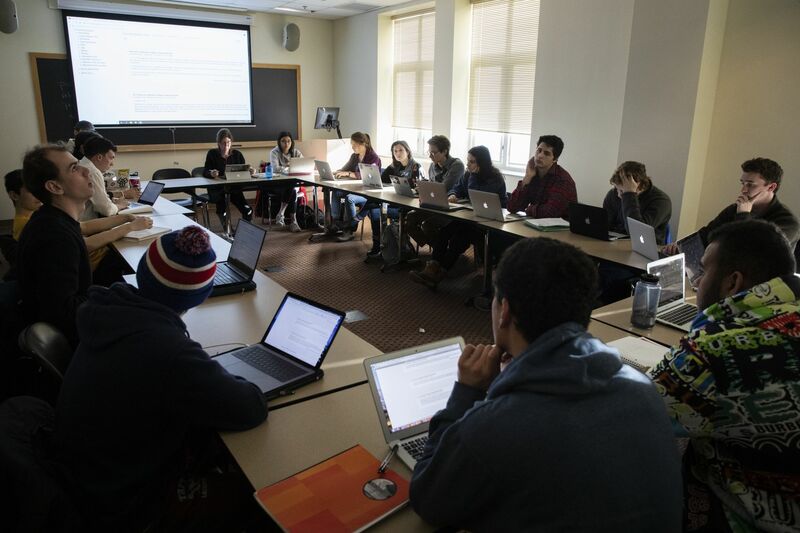 On the third floor, Professor of Psychology Amy Douglass’ psychology and law class is deep in a discussion about Perry v. New Hampshire, a U.S. Supreme Court case that gets at the heart of her research interests: how suggestion can influence eyewitness testimony to the point of getting something wrong. At the moment, sitting at the head of a rectangle of tables and chairs in the small seminar room, Douglass and her students are asking questions about the role of juries in evaluating eyewitness testimony. Juries often aren’t aware of the psychological research surrounding memory, suggestion, and eyewitness testimony, meaning they themselves might be unduly swayed by a witness’s inaccurate memory. So why doesn’t every defendant elect a bench trial, in which a judge delivers the verdict instead of a jury? someone asks. Some kinds of cases require a jury trial, Douglass replies. And juries tend to be more lenient anyway. It depends on the case. There’s being asleep. There’s being awake. And there’s that fantastical, if frustrating, state of being, well-known to generations of college students, that’s somewhere in between. 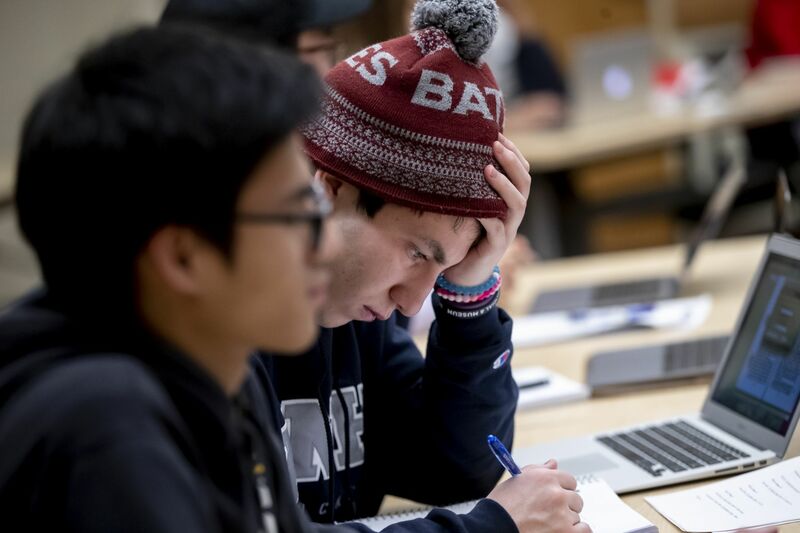 Pieter Cory ’22 of Dublin, Calif., is dozing and studying in the Perry Atrium, trying to prepare for a politics class on states and markets taught by Jason Scheideman, a lecturer in politics. In Perry Atrium, Ned Moreland ’19 of Monkton, Md., chooses a table close to the windows to sort out the logistics for a series of upcoming job interviews. In an armchair nearby, Grace Warder ’20 of New York City reads an article about the normalization of nature for an evening politics course. Just outside, snow amplifies natural light. While it’s not snowing right now — there was a light dusting last night — snow covers the bushes just outside and the Puddle beyond. It’s gathered in banks along sidewalks, and in crusts on cars in the nearby Lane Hall parking lot. 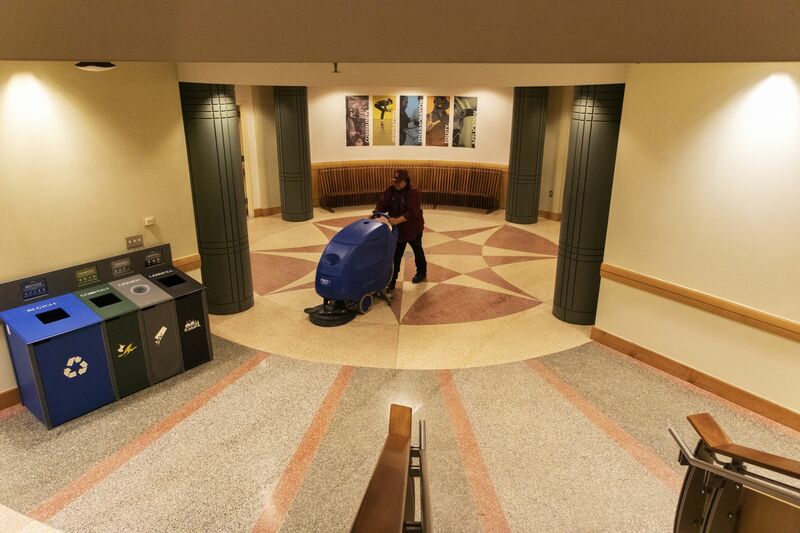 Facility Services custodian Paul Butler attempts to keep the Pettengill lobby clear of tracked-in sand, a big challenge during an icy winter. The 10 minutes between class sessions in Pettengill is like a tide. 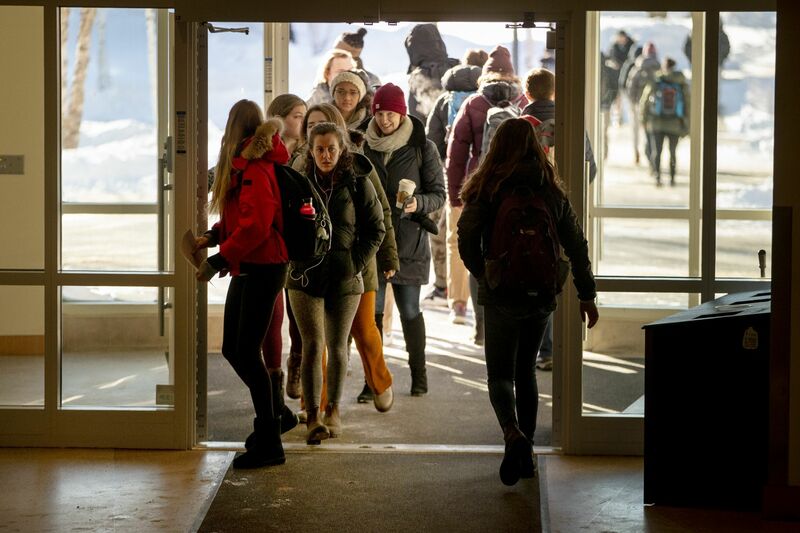 Students and faculty spill from classrooms and into stairwells and the atrium, exiting through the front doors or one of many side doors on the first or ground floor. The next batch of students at first trickles in through the front doors one or two at a time, heading towards the lecture rooms in the basement or the seminar rooms upstairs. Then it’s a flood. Dozens of students stream across Alumni Walk and into Pettengill. Soon the just-buffed floors are gritty with sand. The atrium echoes with shuffling feet, opening doors, conversations. 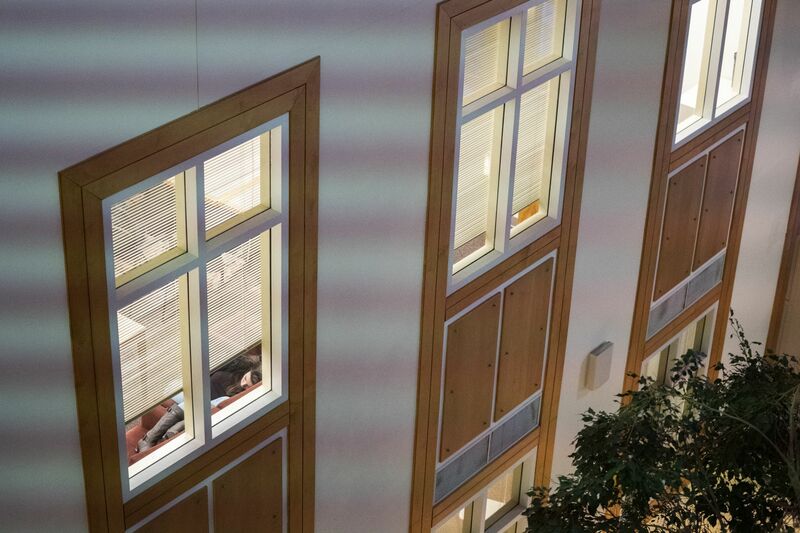 Just as the clock strikes 8, or 9:30, or 11, silence falls and traffic stops, leaving some students sitting in the atrium or in the stairwell nooks. You can hear the tap of keyboards and the rustle of turning pages. The ding of an elevator. The unzipping of backpacks. The muffled chatter over custodians’ radios. Quiet good-mornings. Exactly on the hour, Professor of Sociology Francesco Duina pivots to a discussion of Thomas Hobbes’ conception of human nature. His course on the theoretical foundations of sociology is held in Room G65, a large ground-floor classroom that leaves plenty of space to move at the front of the class, or sit at the back. A full audiovisual system is available, but Duina only needs the chalkboard. Hobbes, a 17th-century philosopher, assumed that humans form societies and behave themselves only because they fear retribution from an authority figure. 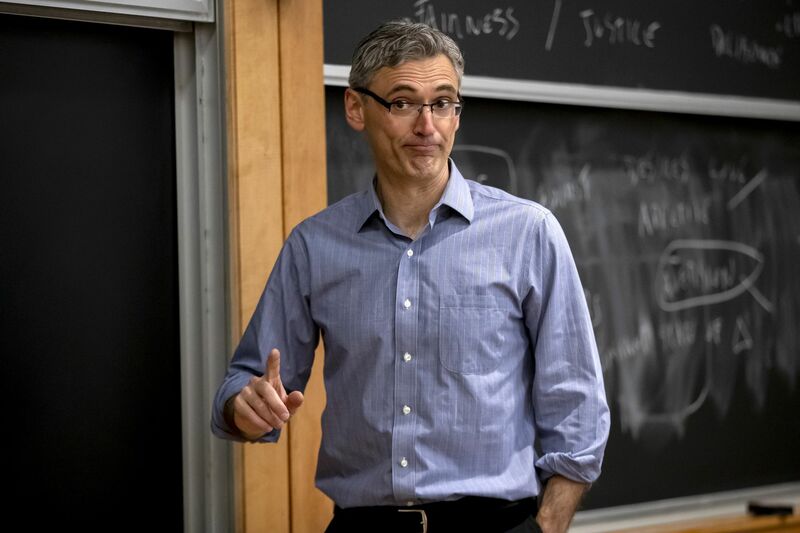 His philosophy is in part about our primal fear of a violent death — but the lesson, structured as a back-and-forth between Duina and the students, is lighthearted. Duina picks random students as hypothetical Hobbesian authorities. Stealing from the cookie jar is their main example of breaking the social contract. The students validate each other’s childhood fear of getting pulled under the bed by their feet as they sleep. 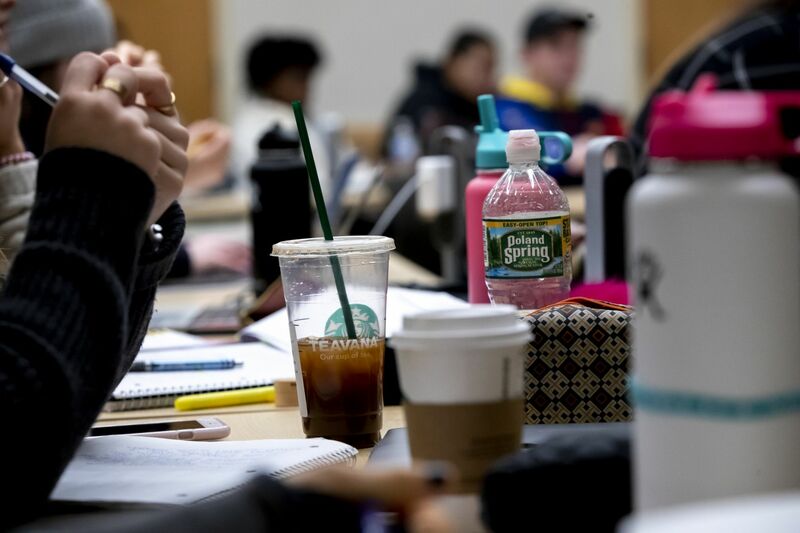 Caffeine and water: the elixirs of morning academics. Sarah Douglas ’19, a history and English double major from Bryn Mawr, Pa., meets with her thesis adviser, Associate Professor of History Joe Hall, the professor who pedaled his way to campus. Douglas is studying the development of federal policies of Indian removal in the 1820s and 1830s, with a particular focus on Andrew Jackson, “who is at the heart of that story,” Hall explains. 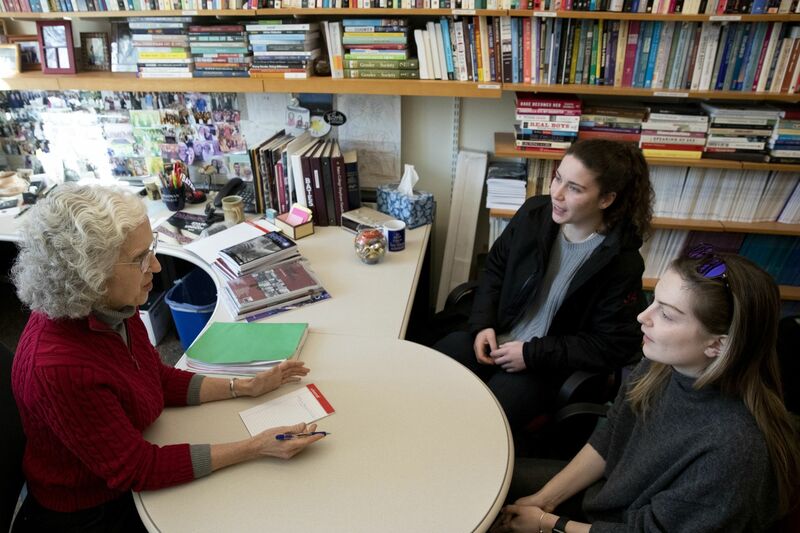 In her office, Professor of Sociology Emily Kane meets with Eliza Statile ’19 (center) of Ipswich, Mass., and Sydney Howard ’19 of Ashland, Mass., about plans for the sociology club they founded this year. 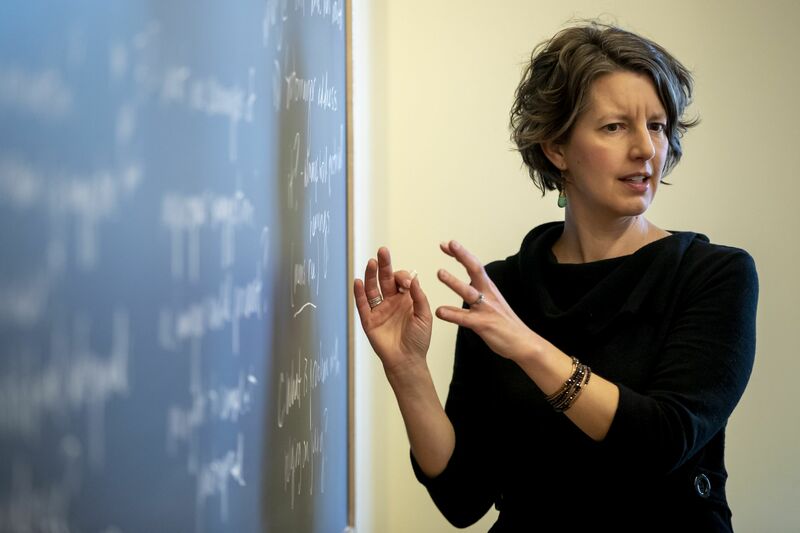 “Our predecessors dutifully kept everything,” says Assistant Dean of the Faculty Kerry O’Brien. O’Brien is our guide into what’s long been called the “bomb shelter”: a series of underground chambers created in the early 1960s during construction of Lane Hall and the maintenance building, where Pettengill Hall now stands. 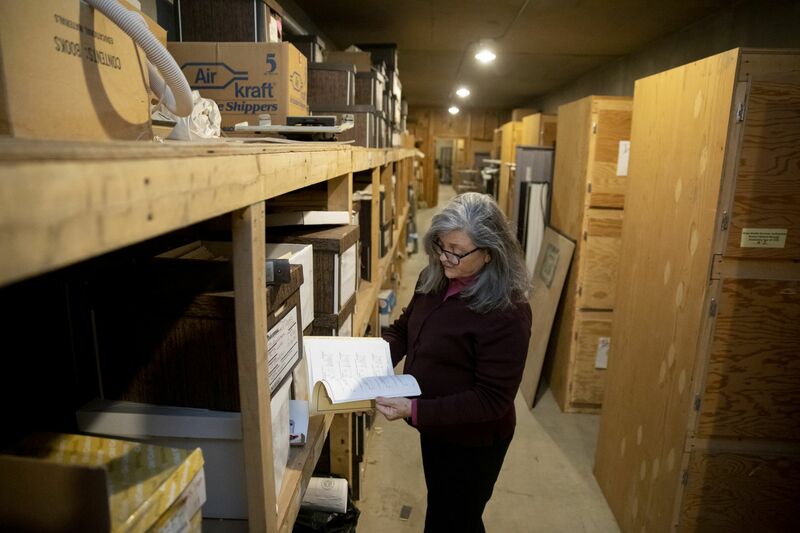 Stored in one section of the bomb shelter, the files for the Office of the Dean of Faculty include resumes, applications, journal articles, correspondence, travel receipts, grant documentation, course evaluations, event programs, etc., spanning the entire Bates careers of just about everyone who has ever taught here. 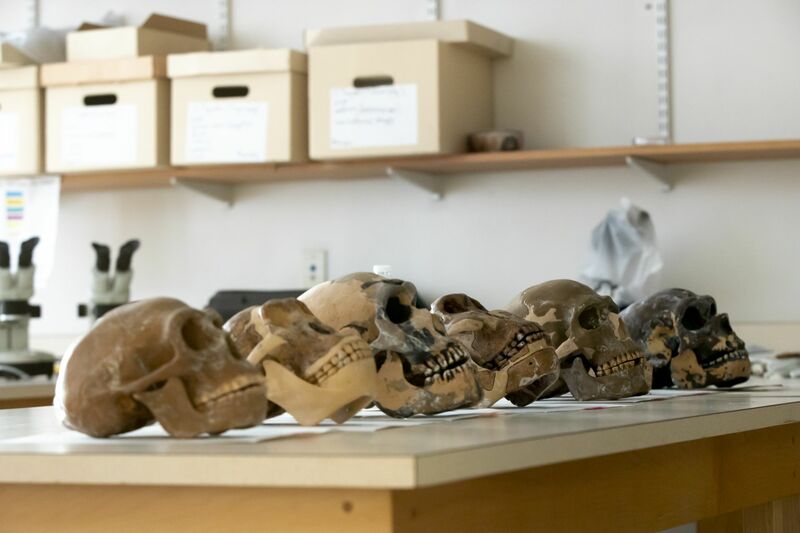 As if awaiting further instruction, these cranium casts sit on a table in Room G17, the anthropology lab, where they’re used in an introductory course on human evolution. A person could get lost in the Googlesphere trying to find the correct geometric names to describe some of the room shapes on Pettengill’s ground floor. On either side of that door are a few small panes of glass, a typical Pettengill feature, affording the only views out of the room. You can’t see campus, but you can see the world: two world maps, and one of Europe, are posted on a bulletin board. Barnett’s students occupy small desk-chair combos that nearly fill the remaining space. Three or four coat hooks by the door are in use and the rest of the coats are draped or heaped or stuffed wherever. The muffling effect of the bodies and outerwear, plus a whine from the HVAC system, lends a subdued or even intimate quality to the acoustics. The ebb and flow of Perry Atrium is at an ebb. Natural light illuminates the room, adding to the atrium’s feeling of great openness. The floor-to-ceiling windows offer a view of the Puddle, coated in a fresh layer of snow. 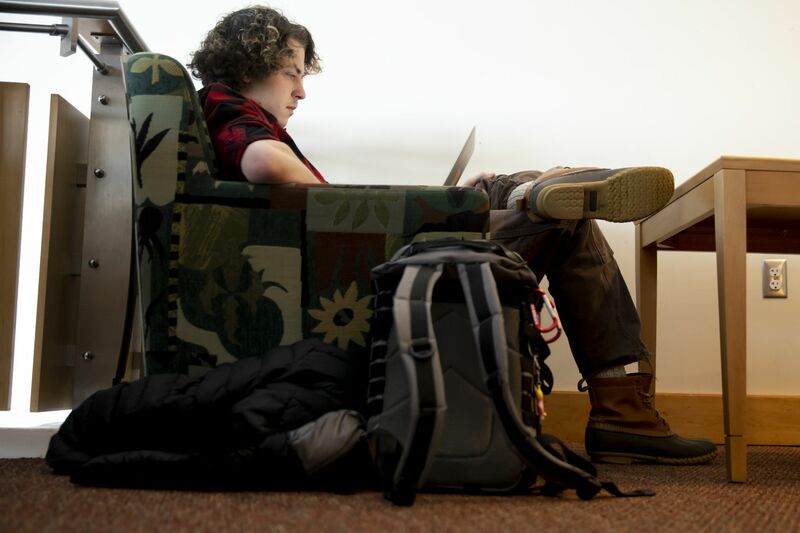 Students sit and sprawl on couches and chairs, headphones in, catching up on their reading or editing papers. Then there’s a faint jingle of metal. Louder now, a squeaky toy nearby. Then, a clatter of paws and heavy breathing. Chaos ensues. Two small furry bodies fly through the atrium. Jumping onto a couch, they collide, ricochet, and then bound back onto the floor, where they return to their owners. One is Teddy, Catie Moran’s brindle pug. His companion, 2-year-old Coco, belongs to politics professor James Richter. Coco doesn’t come into work every day, but she and Teddy have play dates about once a week. Several students, including Elise Lambert ’22 of Amherst, N.H., Elise Grossfeld ’21 of Bethesda, Md., and Saylor Strugar ’21 of Boulder, Colo., take a break from their studies to take their phones out and record the dogs’ escapades as they scamper from one end of the room to the other. 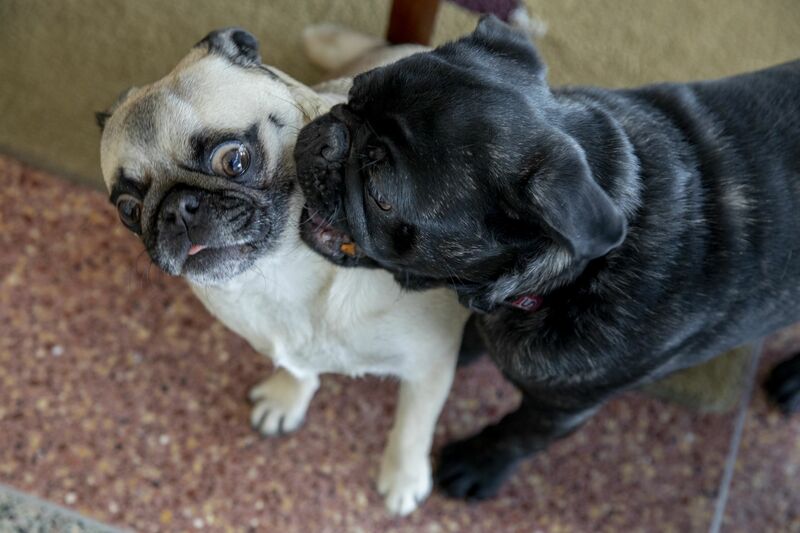 “Oh wow, the snorting!” a student exclaims as the pugs happily wheeze about the atrium. Charlotte Lynskey ’21 of Costa Mesa, Calif., looks up from her statistics homework to watch Teddy and Coco frolic. After their 15 minutes of play time is up, Teddy and Coco are put on their leashes and made to say goodbye as they are ushered back to their owners’ offices. The quiet resumes. Vice President for Academic Affairs and Dean of the Faculty Malcolm Hill talks with Kelsey Professor of Neuroscience Nancy Koven during a regular meeting of the faculty’s Academic Affairs Council. 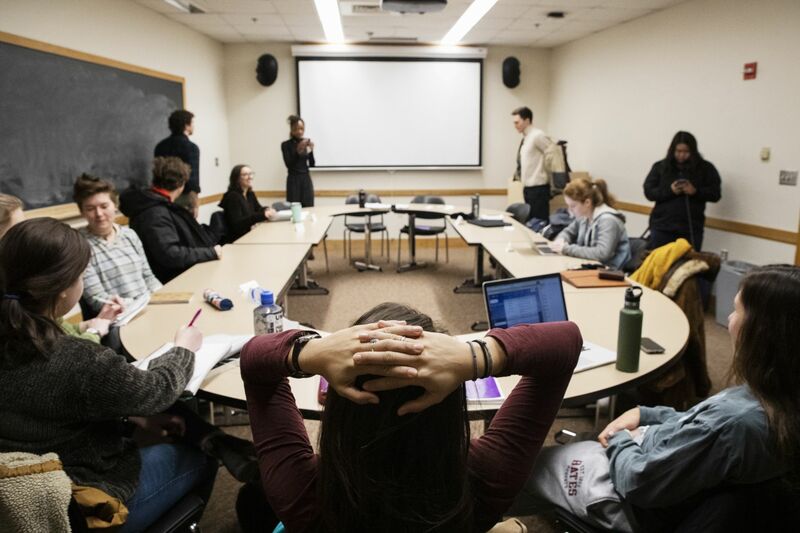 Comprising the faculty chairs of the college’s four academic divisions (Natural Sciences, Social Sciences, Humanities, Interdisciplinary Studies), the council is like a cabinet. As a group, it’s responsible for setting long-term priorities, allocating resources, and providing oversight of the curriculum. 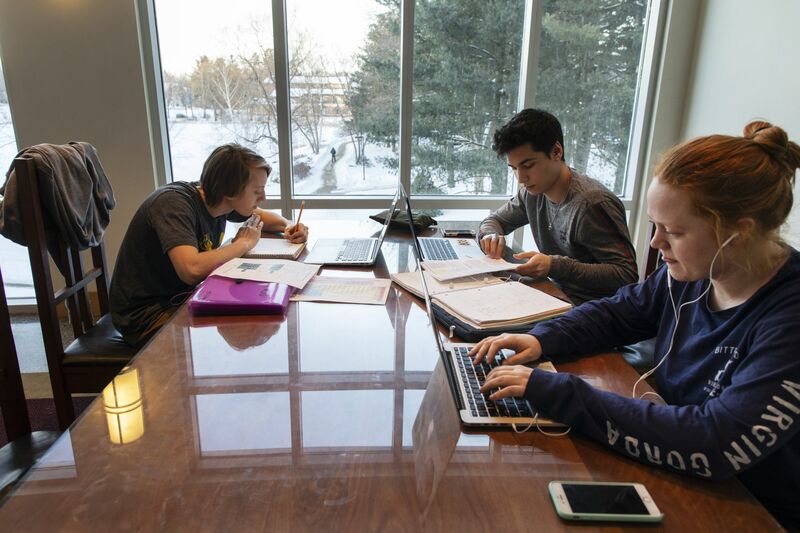 From the vantage point of the Moody Room, it’s easy to see Pettengill’s geographical advantage: Students stream directly from breakfast or lunch in Commons, hands in pockets, just a couple hundred yards to their morning classes. 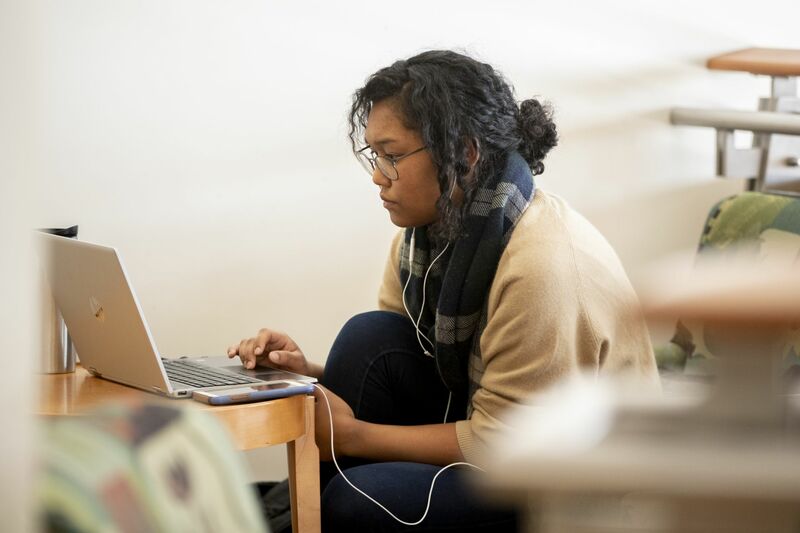 Ursula Rall ’20 of Kent, Ohio, works on an application for a summer fellowship while seated on the third-floor landing. Leading the class is Andrew Baker, assistant professor of history. He’s an upbeat and energetic teacher who asks the class to break into groups for peer reviews of an assignment in progress — “whatever it takes to get you from Point A to Point B” with the assignment. Baker’s students sit around a rectangle of tables, a setting that makes plain the impact furniture choices can have on interaction: Tables promote it, while single desks discourage it. Even with the tables, the physical configurations of the teams reflect the internal dynamics. The groups whose members can all face each other seem livelier and more productive. 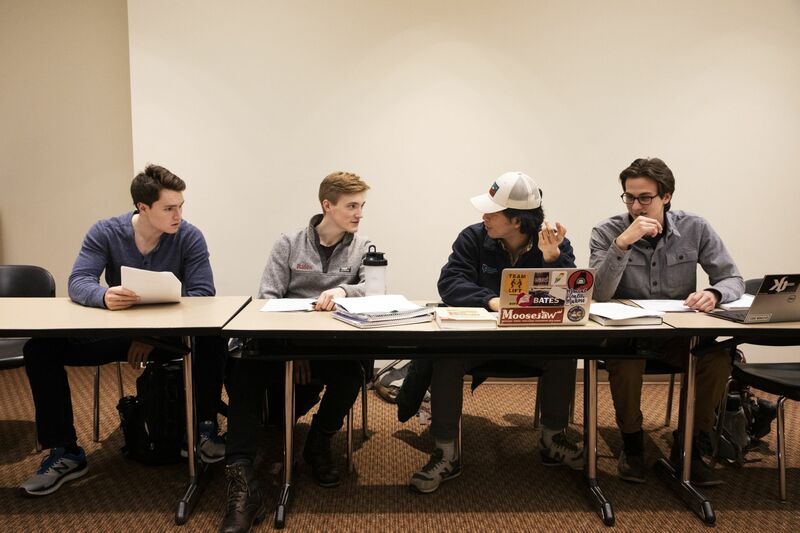 In contrast, members of another group are aligned along the table edge, making it harder for the students at either end to take part. 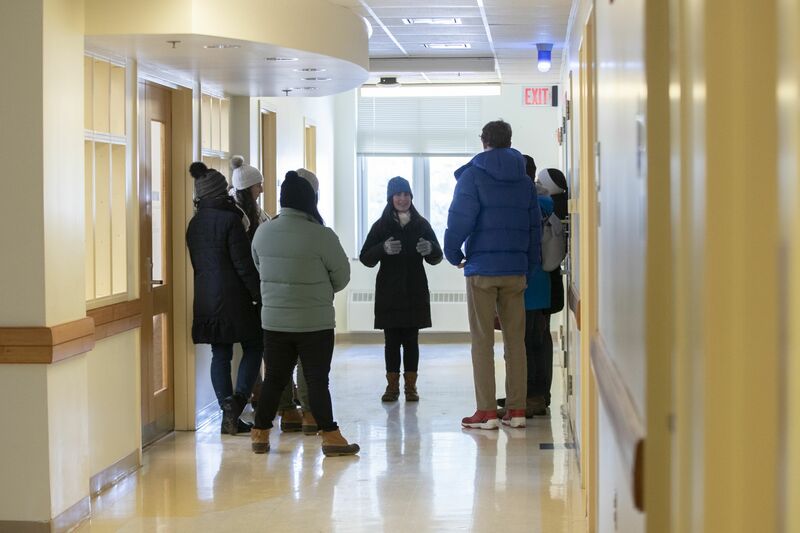 An Admission tour stops on the first floor of Pettengill Hall outside the lounge serving the Department of History and the Program in Latin American Studies. 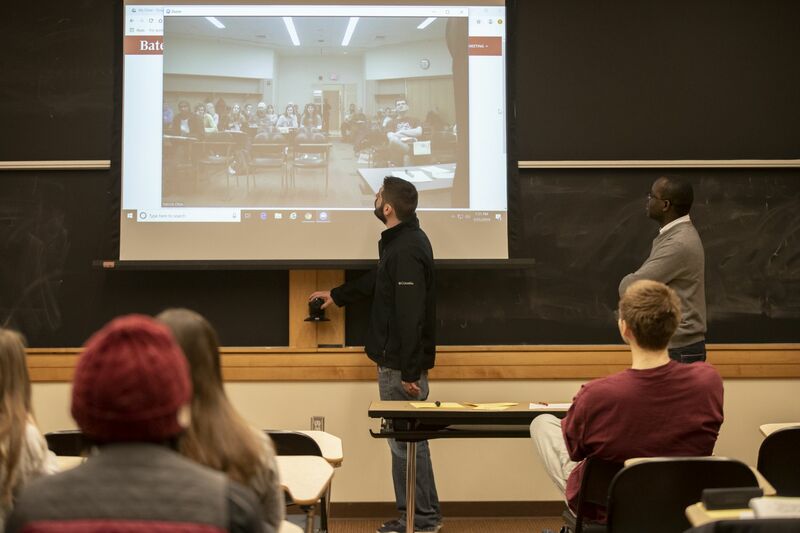 Ben Pinkham (center) an audio-visual analyst for Information & Library Services, arrives in Room G67 to straighten out a video-conferencing issue during a class that Assistant Professor of History Patrick Otim (right) team-teaches with Associate Professor of Anthropology Elizabeth Eames. Others on the course’s teaching team are Leslie Hill (politics) and Alexandre Dauge-Roth (French and francophone studies). The course is “African Perspectives on Justice, Human Rights, and Renewal,” and it seeks to introduce students to some of the experiences, cultural beliefs, values, and voices shaping contemporary Africa. 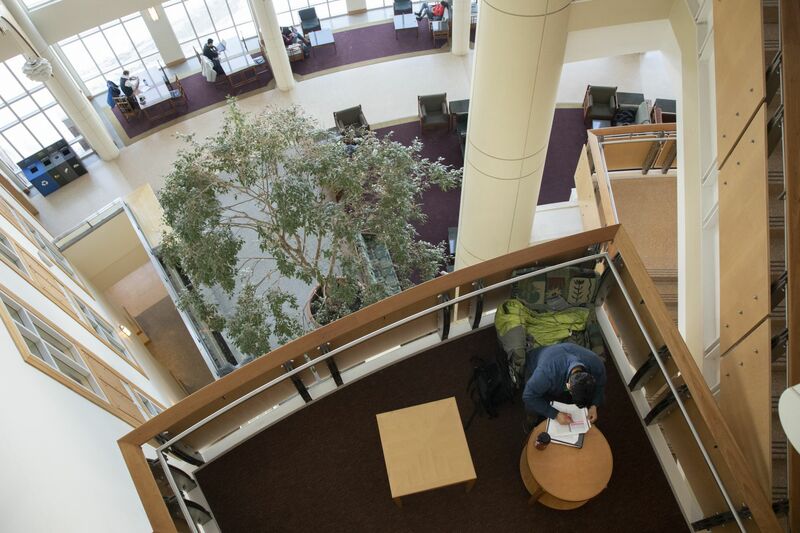 Seated in one of the Perry Atrium overlooks, a student is engrossed in his academics. 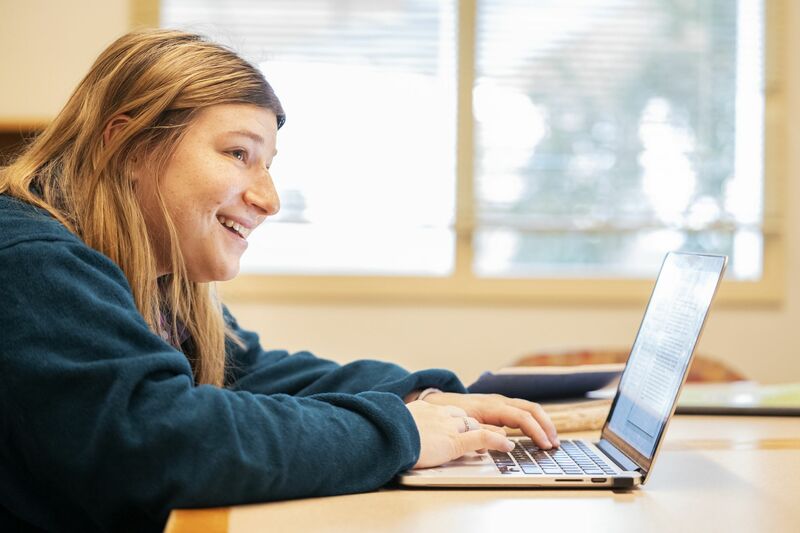 Working in the Lindholm Sociology and Economics Lounge, Peri Brookman ’21, an anthropology major from Los Angeles, works on a paper for a course in queer and trans sports studies taught by Professor of Art and Visual Culture Erica Rand. No need to turn on the lights in Lynne Lewis’ economics course on water resources and fisheries economics — in Pettengill 257, a west-facing seminar room, mid-afternoon sunlight streams through the windows, brightening and dimming as clouds blow through. The tragedy of the commons is a social science concept that assumes that if everyone has access to the same resource, they’ll take more than they need and deplete the resource. The first thing the class does today is discuss how the concept relates to bluefin tuna fisheries and illegal fishing, the subject of a film the students watched a couple days ago. Lewis, the Elmer W. Campbell Professor of Economics, leads the discussion before handing it off to a student, who presents on a reading about the extent of illegal fishing. Projected for the class is the course website, where the students have contributed to an online discussion of the article. 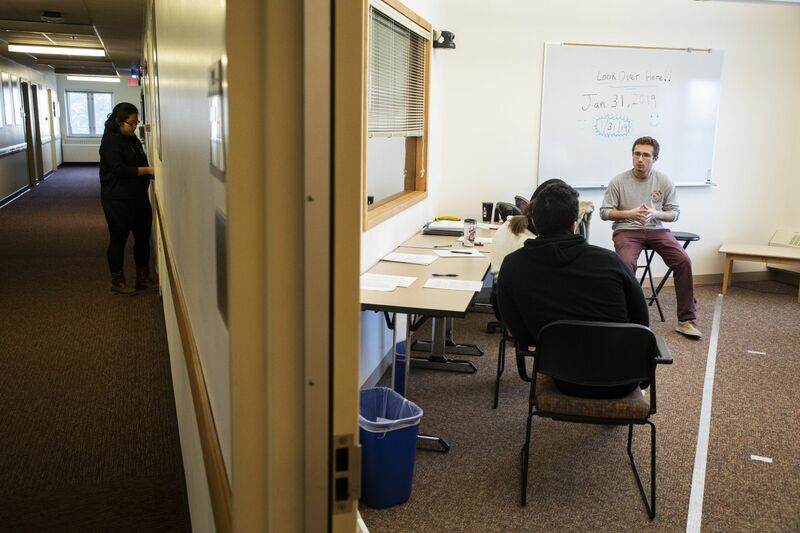 Like all Bates students, psychology students have the opportunity to conduct research, often in a suite of laboratories on the third floor of Pettengill, where Gabe Siegel ’19 of Bethesda, Md., is studying eyewitness identification. In the hallway is fellow psychology major and research assistant Ahimy Soto-Garcia ’21 of Trenton, N.J. The labs have seating and computers for experiment participants; some have dividing screens so that participants doing solo tasks don’t get distracted, and one has a colorful carpet and toys. There’s also a small observation room, complete with two-way mirrors and cameras. 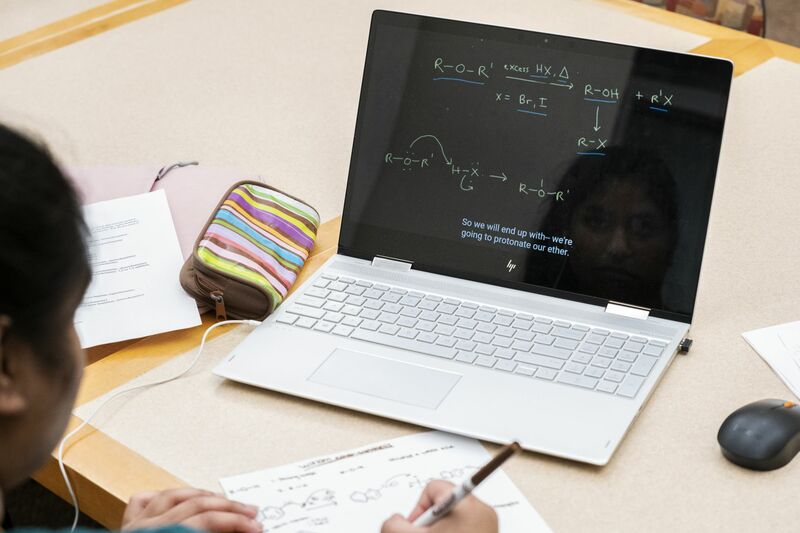 The subjects of student research are often fellow students, who participate for credit in psychology classes or a small payment. For this experiment, Siegel asked his classmates to sign up with a friend — once they get there, they’ll go through the tests together or swap partners with another pair. 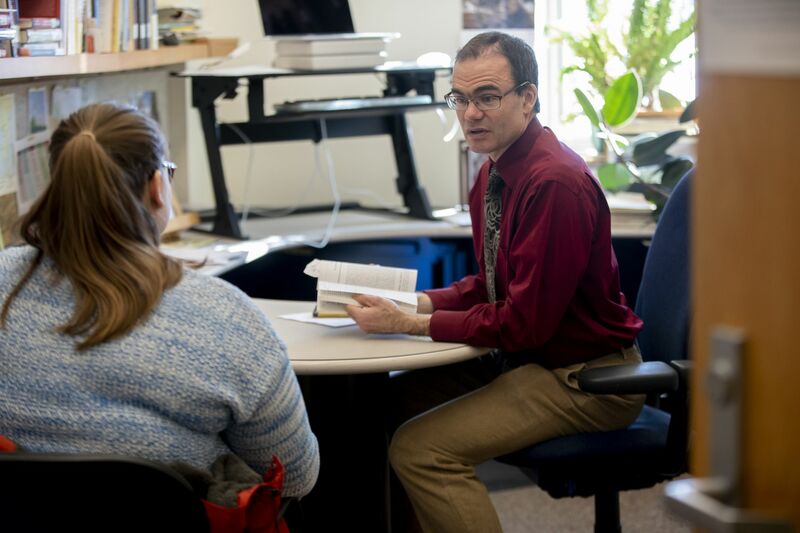 Siegel — whose adviser is Amy Douglass and who was in Douglass’ psychology and law class this morning — finished his senior thesis on eyewitness identification last semester; he’s continuing to collect data through the spring. At this time of day, most of the tables and chairs in Perry Atrium are occupied. Studying together at a table near the window wall are, from left, first-years J.D. Glenn of Carbondale, Colo., Seren Parikh of Bedford, Mass., and Anna Reaman of Hingham, Mass. Parikh works on a chemistry assignment involving crystalline structures, Glenn studies for a chemistry test tomorrow, and Reaman watches lacrosse highlight videos. 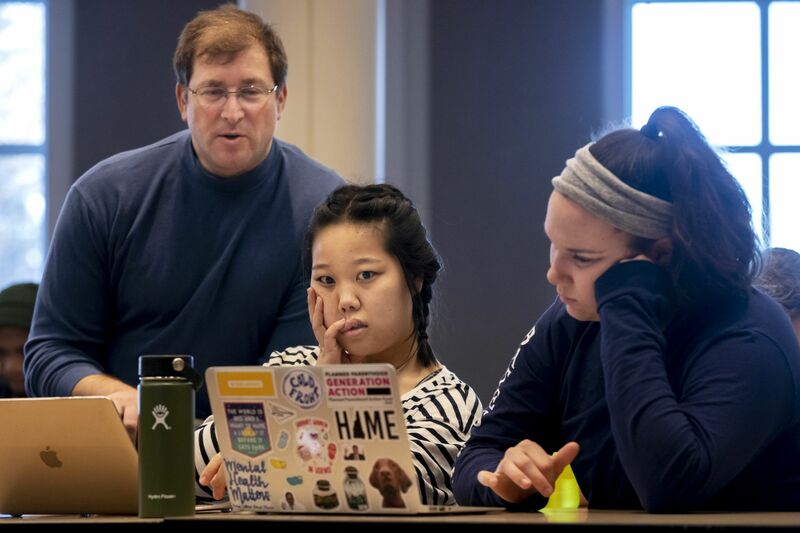 Nearby, seniors Katie Allard of Ridgewood, N.J., and Catie Spaulding of Huntingtown, Md., study the historical economics of Northern Ireland and apply to the Peace Corps, respectively. Pettengill is “home,” Spaulding says; she spends so much time here. Allard, a lacrosse player like Reaman, says Pettengill is the first academic building she shows first-year players. She adds that the 24/7 computer labs are a godsend. 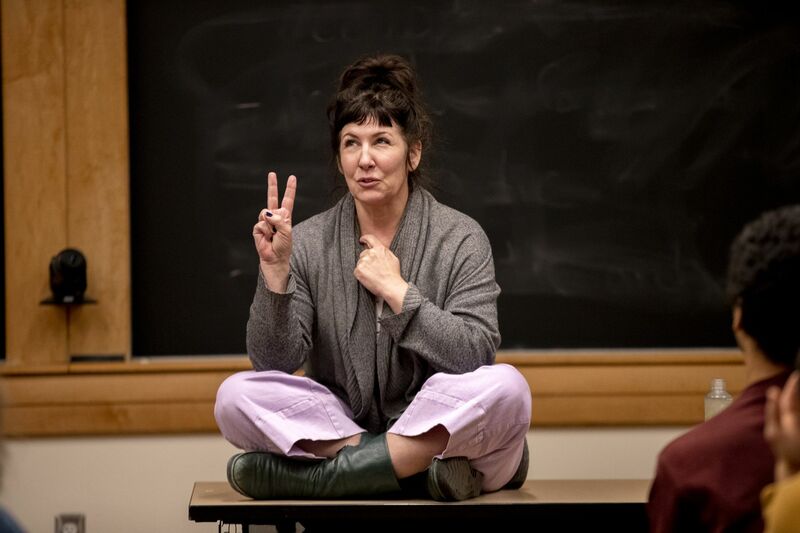 If something is due, “the entire class will be there, everyone helping each other,” she says. 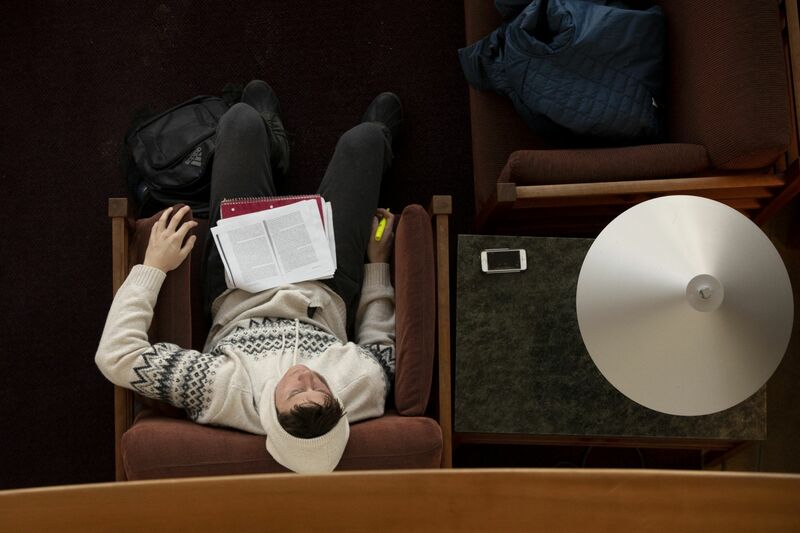 The college’s administrative hours conclude at 4:30 p.m., but the students follow the circadian rhythms of college life. Among tonight’s activities are classes, squash, and a cappella. They might find themselves back here, late at night. Back in the expanse of Keck Classroom, a 4:30 talk on the politics of charter schools, by John Kosinski of the Maine Educational Association, is about to begin. 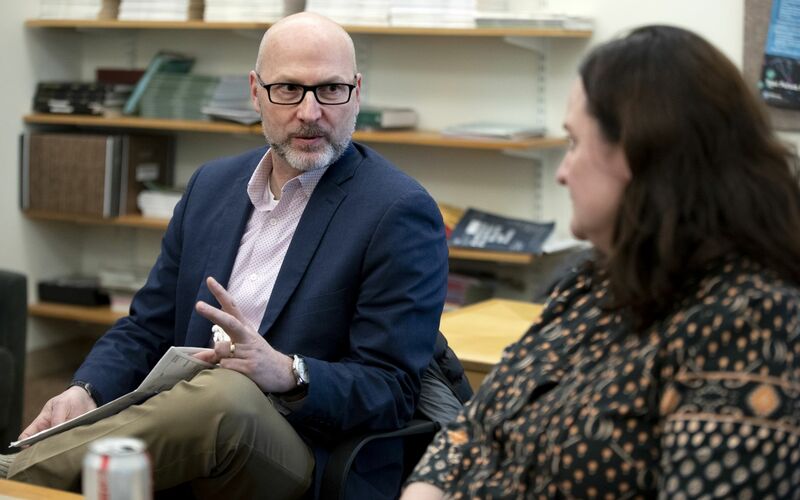 It’s a public event in the Harward Center’s Theory into Practice series, which affords an “opportunity to learn more about important policy debates, and how to have a voice in them,” says organizer and Harward Center executive Peggy Rotundo. Keck has a PA system that Kosinski doesn’t use (“I have a voice that carries,” as his mother used to point out). And Keck just looks elegant even at age 20: Wood paneling in two shades of blond, studded with eye-catching decorative acorn nuts (the fasteners, not the tree seeds), covers much of the wall surface, with serene gray-brown acoustic treatment over the rest. 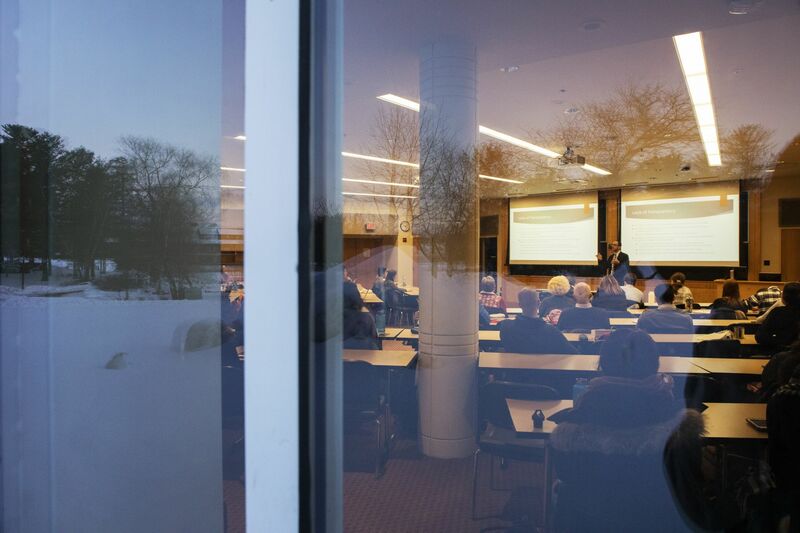 Unlike most of its sibling ground-floor classrooms, G52 also boasts stunning northward views toward Lake Andrews and the Olin Arts Center. But with so many of the room’s features steering your attention toward the front — the converging light fixtures, the chevron arrangement of the seating, the massive screens — it takes some effort to crane around and watch the daylight fading from the sky and snow. Seen from one of the atrium’s overlooks, Saylor Strugar ’21 of Boulder, Colo., who earlier joined the pug party in Perry Atrium, takes a break from studying in the Lindholm Sociology and Economics Lounge. 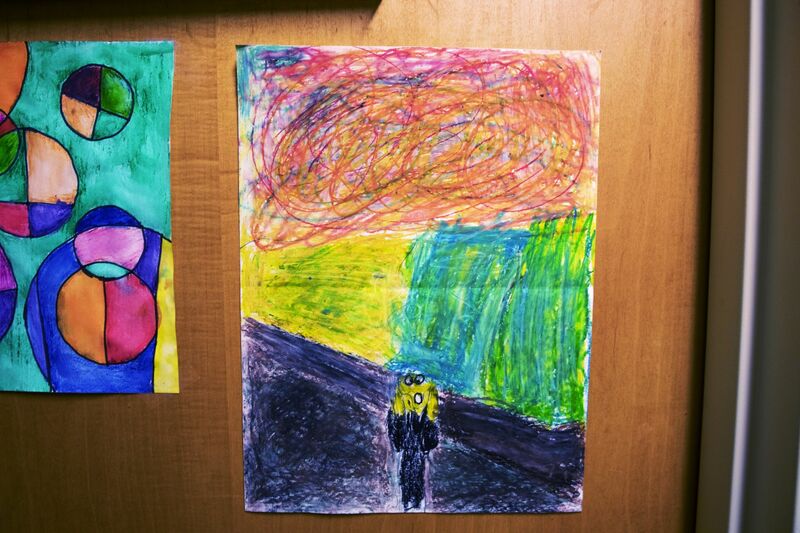 A child’s homage to Edvard Munch’s “The Scream” hangs on the office door of Professor of Psychology Amy Douglass. Jasmine Nutakki ’21, a biochemistry major from Augusta, Maine, studies in the lounge serving the Program in Latin American Studies and the Department of History. Custodian Franky Urueta likes working the late shift on the Pettengill’s ground floor — the schedule permits him to take his kids to and from school. 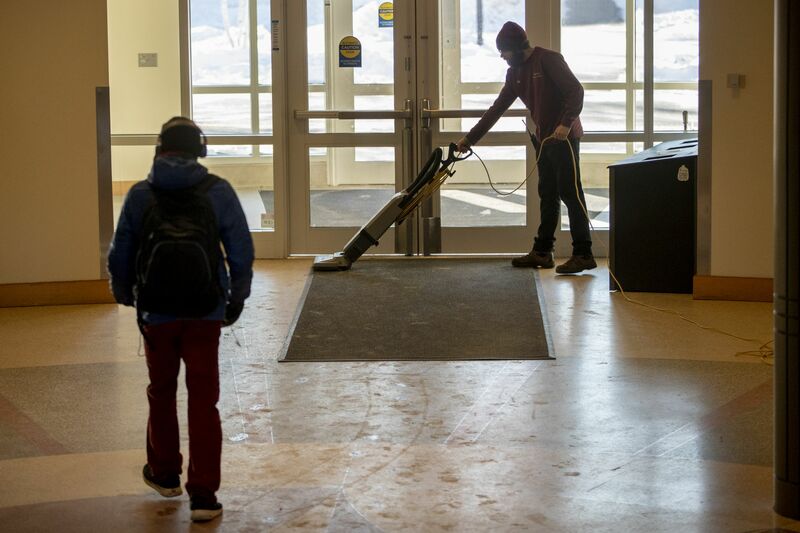 Right now, he’s cleaning the floor with a scrubber, pausing to give his signature fist bump to passing students. Two economics teaching assistants gather in Room G10, ready for all comers. They’re Mark Russell ’20 of Westford, Mass. and Jason Lu ’20 of Westborough, Mass, first and third from left. Will Zimmerman ’21 of Weston, Mass., and Andrew Berg ’20 of Titusville, Fla. have arrived to go over concepts for an upcoming test. Attendance is light today because the TAs’ potential clients, students in an econometrics course, turned in a lab assignment yesterday. But the test is a couple of weeks, and Russell and Lu help Zimmerman and Berg review, using previous exams as a study guide. Room G54 is a seminar room tucked between the lecture-hall giants of Keck and G65. Unlike other classrooms, it boasts a few C-shaped tables in addition to standard rectangles, allowing the class to form a proper oval. 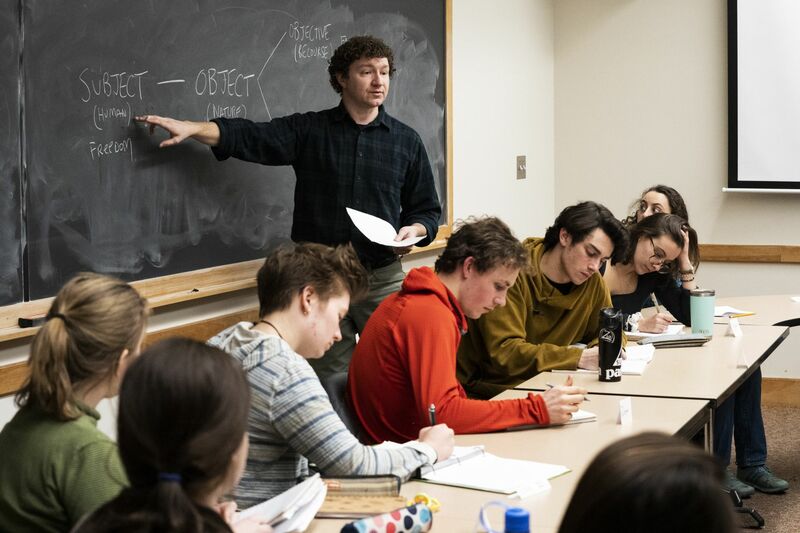 As students arrive for their evening seminar on the politics of nature, a few students move two rectangular tables to the side — they know their instructor, Lecturer in Environmental Studies Ethan Miller ’00, likes to have a shorter oval. Once he gets there, Miller notices the modified setup and thanks the students. For the first few minutes of class, Miller reviews the philosophical concept of subject-object dualism. 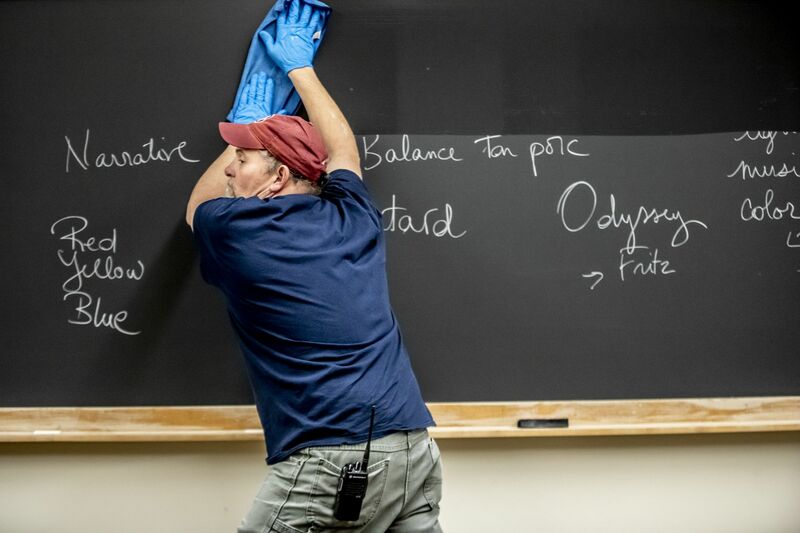 On a chalkboard, he writes a series of interrelated terms — subject, object, things, reality, naturalization, exploitation — and draws lines to reflect how they connect. The resulting diagram looks like Pac-Man, which is what Miller has named it. Next door, Room G65 is a whirl of nervous energy. Dozens of students have an organic chemistry test tomorrow, and the twice-weekly Peer Assisted Learning session is jam-packed. 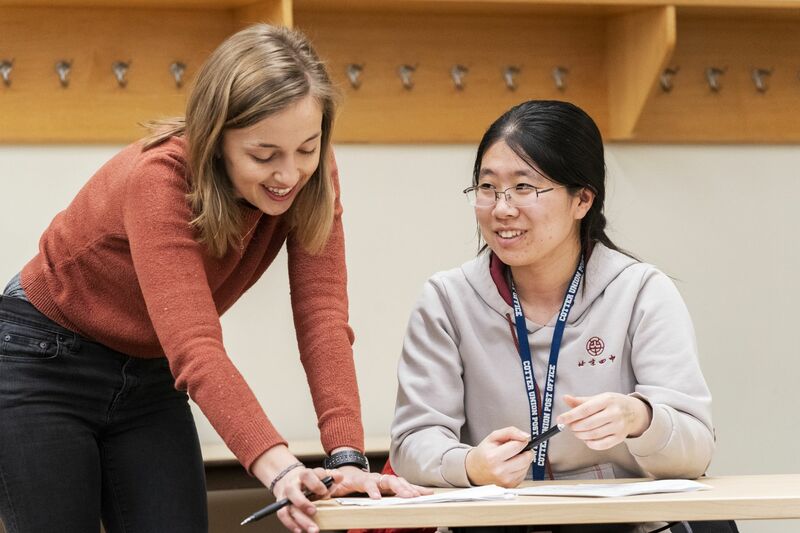 Ernestine Whitaker ’20 (left) is a PAL student leader from San Luis Obispo, Calif., and she moves around the room to help, stopping to work with Wuyue Zhou ’21 of Beijing. Packets of handouts and worksheets with diagrams of various carbon-based molecules are available. Some students work on them solo, earbuds in; others confer in groups. 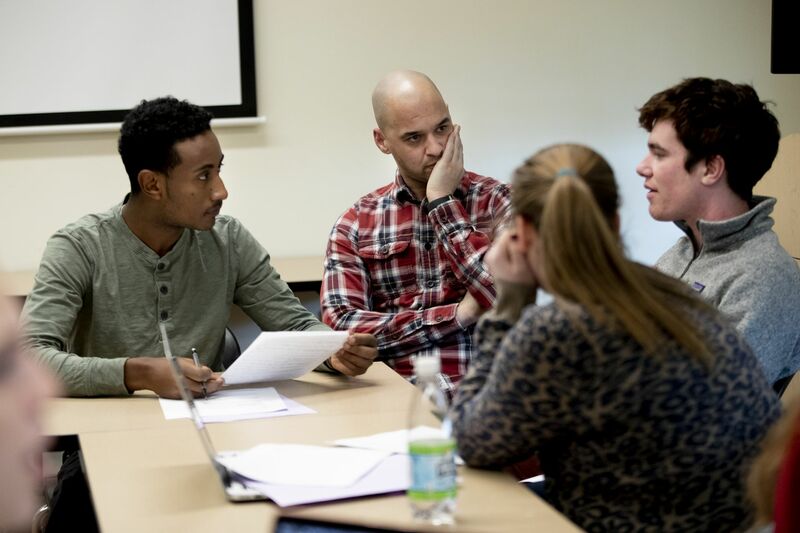 Student PAL leaders circulate to answer questions — the sessions are meant to be noncompetitive and inclusive, promoting learning strategies as well as course content. Whitaker moves to a group that’s seated together. “There’s a lot of material to review,” concedes Devin Russell ’21 of Falmouth, Maine. “These packets are my lifesaver,” says Sofia Esquibies ’21 of Rocky Hill, Conn. 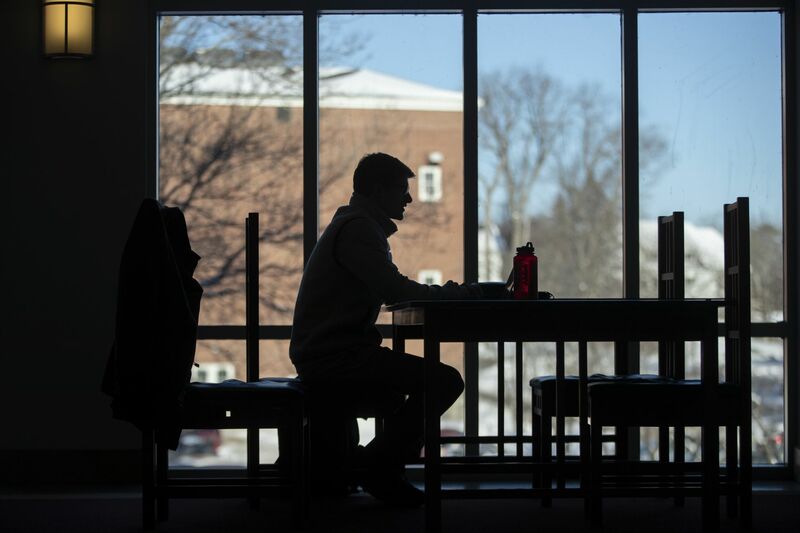 This kind of studying is easier in Pettengill than in a place like Dana Science Hall, says PAL leader Nathan Frederick ’19 of Orono, Maine. “People can sit around tables and actually work with each other,” he says. In various ways, such as notes left behind in study spaces, the students and faculty show their appreciation to Urueta. He keeps some of these mementos on his cart, others in a room near G65. When Urueta’s shift ends at midnight, he’ll go to the students who are still in the building. He’ll tell them he’s leaving and to have a good night. “Before you leave, please turn out the lights. Be careful outside. 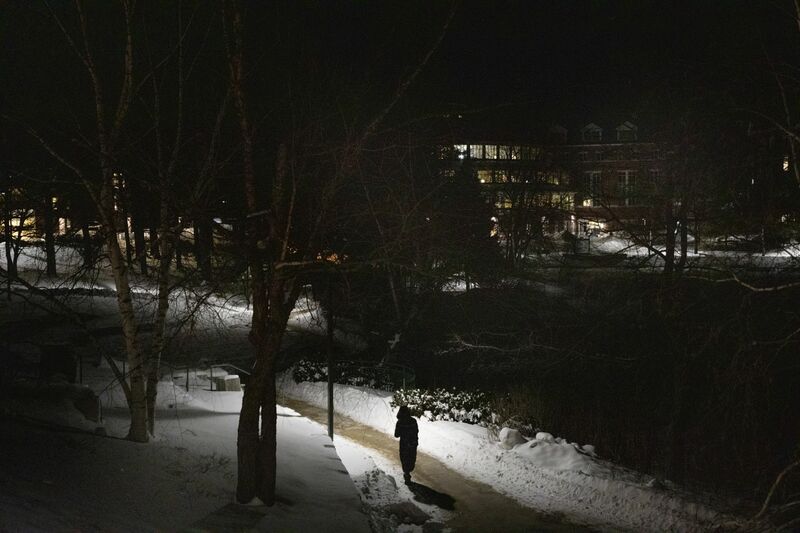 Deep into a dark January night, Pettengill is alight with academic life. Text by Emily McConville, Doug Hubley, and Eleanor Vance ’21. Photography by Phyllis Graber Jensen and Theophil Syslo.